On Sunday, Auckland Transport are changing most HOP fares. They’ve now published the paper that went to their board for approval back in October. 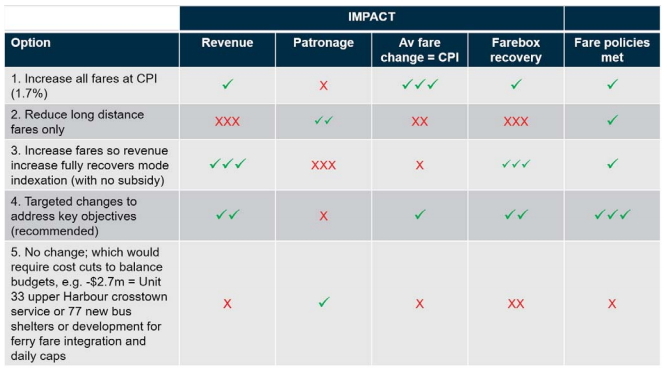 The primary reason given for the increases is the need to boost farebox recovery, the percentage of costs covered by passenger fares. The target for this is 50% although AT mention a range of 47-50%. We did pass 51% in early 2016 however despite rapid growth in PT usage, it’s been declining since then. At the beginning of the financial year we were at 46.8% and as of December, after this paper was written, it was down to 45.9%. There are number of reasons for this and it includes cost increases along with comparatively less coming from fares due to the introduction of simplified fares and more people paying by HOP. As such, a number of projects have already been deferred or scaled back to account for this. A further review of service levels is underway. Cutting back services on the New Network, some of which will includes having fewer all day frequent services, is only likely to exacerbate the issue as it will be less attractive users and therefore result in comparatively fewer people using PT – although probably still more than do now. We’ll be looking closely to compare what’s rolled out with what was confirmed following consultation. How much will it raise? All up, AT expect that the fare changes will bring in another $2.7 million in revenue. This is obviously less than the cost increase and the rest would be covered by funding from council and the NZTA. As a result, it is expected to increase farebox recovery up to 47.4%. The fare changes average out as a 2.4% increase for bus/train fares and 2.1% for ferry fares. The impact is shown in the table below. One thing you can see in the image above is that AT expect the changes will result in 600k fewer journeys than they would otherwise have had. The increase is also higher than the increase in CPI of +1.7% but they say that “this reflects improving service levels and amenity, and better value for money perceptions“. 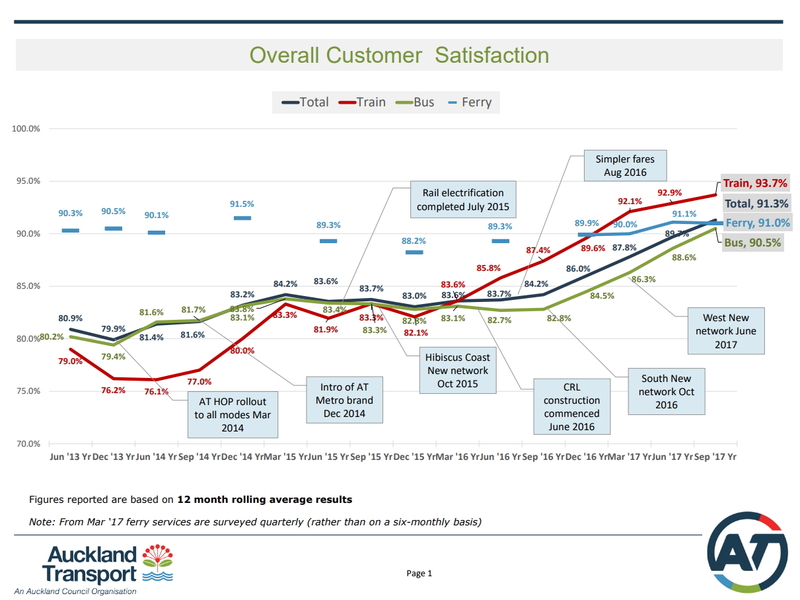 They point to the improving customer satisfaction numbers as proof of this. One interesting comment about the ferry increases is below. The key driver for the ferry review was to ideally fully align inner-harbour ferry fares with 3-zone bus/train fares. This would complete the alignment of the three ferry “zones” of inner, mid and outer harbour services, to the 3-zone, 5-zone and 8-zone bus/rail fares respectively, in preparation for full integration of ferries into the Simpler Fares structure. As far as I’m aware, integration of ferry fares into the Simpler Fares structure doesn’t mean they’ll be the same price as bus/train fares i.e. it won’t be a 2-zone fare to go from Devonport to the city, like it would be if done by bus. But it does mean that you can pay a single fare for your journey so you’re not paying a separate fare if you then jump on a bus/train to get somewhere. It’s unknown when ferry fares will be integrated with HOP. 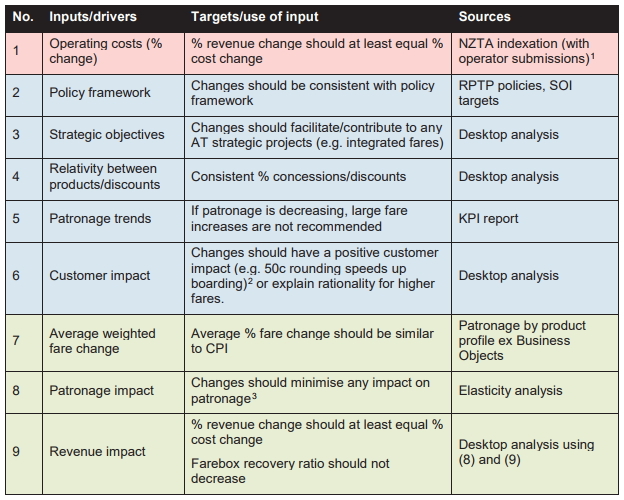 In an attachment to the report, AT lists the below areas they consider when making fare changes. It will not be possible to achieve all targets, as some are mutually exclusive. Therefore, AT will need to balance any competing demands and trade-offs to derive a fare schedule that best meets the overarching objectives of the RPTP. Note the above list is not ranked in order of importance – all variables are considered equally (i.e. it’s not a weighting exercise). And another attachment shows five different scenarios that the modelled the impact of. They went with option 4. I think what some of this highlights is that we need to get smarter at a policy level with how fares are set. The 50% farebox target is probably a satisfactory goal if we had a mature and relatively stable network, but we’re not in that state yet. First, we need to get our PT network to a minimum viable standard. That includes having clear and logical routes and good all day frequencies on key routes (and with appropriate priority). This is what the new network was intended to deliver and is now being compromised by that farebox target. In my view, the farebox target needs to be lowered until the new network (including rail frequencies) are in place and have had sufficient time to bed in. This is a change the government should be able to make (and fund) relatively quickly and easily. We should also consider longer term changes to how we fund PT. We fund most other transport projects, in large part, based on the estimated economic impact they’ll have. For example, we didn’t build the Waterview tunnels based on how much fuel tax will be collected from vehicles using it. We built it based on the expected economic impact it would have. If we were to consider PT services the same way my suspicion is we’d see quite a different result. That’s because as Auckland grows, the value of moving more and more Aucklanders free of congestion (if done right) only gets more valuable. Already more people enter the city centre by PT than by car and my hunch is the value of that to the city’s and country’s economic performance far exceeds the funding that’s provided. Seems stupid that government / AT spending billions on transport yet can’t afford to make a few bus routes more frequent. Crazy stuff. The last sentence “” Already more people enter the city centre by PT than by car and my hunch is the value of that to the city’s and country’s economic performance far exceeds the funding that’s provided.”” Make that a really strong hunch. However the nature of PT is almost full buses going to and from the city centre but many almost empty buses rolling around our suburbs all day. That’s a minor quibble because your main point is PT being a benefit to everyone which is rather similar to the way Waterview benefits drivers who never use it by reducing traffic on other roads. That 50% figure is so arbitrary – make it 33% and see a surge in PT use. The more PT is used the better it becomes. How much time has to pass before they stop calling it the New Network? At some stage it gets very lame before it starts to get cool again like the New Forest or Pont Neuf. In New Zealand, it could be a while. Or New Zealand? We should be the main Zealand already, and the boring bit of the danish coast can be Old Zealand. Presumably it will stop being the New Network when it’s actually deployed in full? Probably once it is actually completed – still to be implemented on the Shore for example. I would hope 1 year after it is finished they will stop calling it that. National had no effective plan to curb emissions and meet the very low targets they set. Labour can do better. “The 50% farebox target is probably a satisfactory goal if we had a mature and relatively stable network,” I would add “if our transport carbon emissions were sustainable.” They’re not. The 50% farebox recovery is a mechanism that is stopping us from taking the measures we need to be responsible international citizens. This slight fare increase will result in 600K fewer journeys. To any sane government that is actually trying to curb emissions from the transport sector, regulation would be in place to stop such a move. AT appears to prefer using simple financial models instead of assessing the total value of increased public transport including carbon emissions. I think that narrow financial modelling is setting AT down many wrong paths, as shown by this 9-input decision model which seems to prioritise income to the organisation itself. The ferry revelations are a case in point. AT states that ferry users have no easy way to escape price hikes (price inelasticity), so as a monopolistic provider their financial model will recommend rorting ferry users if used blindly. But that doesn’t make it the right thing to do. It would be good if their board and senior management showed sufficient judgement and leadership to over-ride the decisions that a non-human model recommends, but here we are. Auckland has to do better than this, and it probably starts with refreshing AT’s board and strategy and setting steep emissions reduction targets on AT. Heidi, I think that you are being exceedingly generous. As best I can tell from a review of the Ministry of Environment website pre -election there were no targets apart from the Paris accord that NZ signed up to. That has had no effect, because in the absence of sector specific targets everyone has left it to someone else to make savings. I think a fairer view of National wrt climate change is that they didn’t care, and if they say they cared, then they certainly weren’t interested; and if there was a National MP who both cared and was interested, then they did nothing! If we look at AT they also appear to have done nothing. I have perused their website to find targets and found nothing. The transport sector is a large contributor to carbon emissions and surely Auckland because it has the greatest number of cars should be setting the lead. The best outcome that I have been able to attribute to AT’s performance is that the number of cars entering the city has not increased in ten years. Wow! And this for the part of Auckland where it should be easiest to reduce car trips. I have recently sent OIA’s to the Ministry of the Environment; AT and Panuku (the latter as they seem to just as ambivalent about climate change; and it will be fascinating to see if they are playing from the same song sheet) to see what respective targets they have. Current figures are appalling with NZ 23% over 1990 levels when the target is 10% below. As you do David B, I wonder what AT’s aspirations for public transport ridership would be if the primary driver was greenhouse emissions. I strongly suspect that with PT ridership growth down to around 3% (December) that greenhouse emissions are growing. Again my OIA request might confirm that. I was going to post this without reference to Panuku, but this is too bad a story to leave out. Panuku have plans to build a 450 place car park in Takapuna which will increase vehicle trips by over 25% by 2046 when targets are to reduce emissions. Although there’s always those other things that should have happened first, a while ago. Like AT should price parking more appropriately (at least to avoid it being 100% full all the time), and Wilson should be coaxed into opening its car parks during evenings and weekends (it doesn’t make sense to have parking for $10 all day during the work week, and then charge $10 per hour during weekends). So …. you are completely wrong. AT’s own publication says Takapuna has a surplus of parking. AT also says that parking demand can be managed by price. So there is no need for extra parking in any shape. And yes many extra ways to access Takapuna are coming. First there is the cycleway for Hurstmere. Second there is $60 million being spent on Lake Road. And there is also the New Northern Network coming in October. It’s a 25 – 30 million dollar parking building that will be almost a complete waste – probably similar to Ronwood in Manukau. It wouldn’t surprise me that a further surplus of parking spaces is caused with the effect that total parking revenue from Takapuna diminishes. It is noticeable that the private sector has not been able to produce a design that stacks up economically and there is no doubt this Panuku one won’t either. Maybe it depends on the amount of ambition. If Takapuna is going to be a local centre then that would be fine. As in, you’d go there occasionally if you’d be living nearby, like in Milford or Hauraki. But my impression is that it’s supposed to be more like a larger “metropolitan” centre. Then you’d assume people would come there from a bit further away. Most of that ‘catchment’ is across the motorway. There are no proposed cross-town services to Takapuna in the New network. I don’t see much plans for cycling either (the North Shore is almost entirely empty in this 10 year plan). So for the majority of that catchment, driving will remain the only reasonable option. I can’t find any cycleway plans for Hurstmere Road. There is a plan to improve the stretch between Lake Rd and Anzac St, but nothing further out. Lake Rd upgrade plans, let’s see how it gets destroyed by the people living nearby. See Northcote Point. Cycling is about the worst faux pas you can do on the streets over here. AT says there’s enough parking and that it can be managed. But they won’t do it. Ideal World vs Real World. Yes, but just because AT isn’t putting in the required PT and cycling infra doesn’t mean they should do further damage by spending lots of money on more parking. It will lower the cost of parking, induce more traffic, and further exacerbate car dependency. I get your point about access, but there is currently sufficient parking there. If you think there won’t be in future, surely we should be joining Taka-ite in campaigning for better PT and cycling infra, not just reasoning why it’s ok to waste these 10’s of millions of dollars? There is also Sky & Sea Path which would help cycling from a wider area to here somewhat. I’m sure once these are done there would be more pressure to finish/improve links to Takapuna itself. Yes I totally agree that it’s not an ideal situation. But we should also look at people and developments in the current context. I’m not going to work or anywhere else 10 or 20 years into the future. I have to get to work today. Or I may want to visit Takapuna beach next weekend (well, OK, maybe a few weeks later depending on weather). When it comes to those parking spots, think about: how many people would buy an apartment with 1 or 2 parking spots vs. how many people would buy an apartment with no parking spots. With all the townhouse developments going on you can easily observe that de facto the minimum for a family home is 1.5 to 2 spots (anything less means that second car will just be parked on the street). It’s still incredibly cumbersome to get around without a car, often to the point that you’d stay home instead of going out. So more apartments = more parking. Will this change? If that 50% farebox target guarantees that AT can never bootstrap a viable PT network for the wider area, then the answer will remain no and we’ll remain stuck with our de facto 1.5 spaces parking minimum. Of course if the plan is to lease it out for just a few dollars per day, that’s indeed a stupid plan. But if prices in the private sector are indeed around $14 per day, that’s significantly more than the CBD (I leased monthly for $10 per day), so a good indication the demand is there. So yes to campaigning for a better future. I just don’t think it’s productive to lean on developers. They’re merely responding to other policies. Save the energy for the underlying problems (eg. lack of frequent PT access from much of the surrounding area. Fares are already high, and IMHO service has declined in recent months. I know it sounds silly, but for no apparent reason getting a short train so commuters have to run down the platform, having the noticeboards not working, being dropped off at different platforms randomly at Newmarket, and having your train leave from different platforms once a fortnight or so comes across as shambolic, amateurish and potentially points to an unsafe network. At 6am in the morning the last thing you want to worry about is how eccentric your service might be. You want a routine service for a routine commute. Same train, same seat, same time, same platform, everytime. If the fare rise helps that sort of thing, then great. But if it is just to help a cash strapped AT fund new projects while their existing customer base is constantly short changed on a (increasingly?) shaky network, then bigger questions need to be asked. Rising patronage hides the effect of poor decision making. Which is why a far higher patronage level needs to be the target, and all strategy needs to be aligned to meet that target. I wonder whether they have included the implicit costs of those 600k trips not being taken on public transport into their evaluation. Fares will still be quite cheap really, especially if you compare it to hiring a taxi or owning a car and paying to park.. You are not just paying for the ride from A to B, you are also paying for a service that allows you to travel whenever you choose to make the trip (almost). Can someone explain how they eventually want ferries to work charge wise? If I take a bus after a ferry will I pay for another zone or it would be included? If so how many more zones before u pay again? My understanding from the comments quoted in this article is that the eventual fare structure for trips including ferries will be similar to integrated fares, but will treat the ocean as a fare zone. Except think it would be a more expensive zone. So I guess doing a ferry to bus trip will be 3 zones for an inner harbour ferry, then one more, say city zone, bus trip would just be $1.40 on top of that (instead of $1.90 if it was a one zone separate additional fare charge). No, it isn’t a more expensive zone. Devonport to CBD you pass through three zones; lower North Shore, the ocean, City Centre. You get charged a three zone fare. If you catch the bus from Belmont to Devenport, then catch the ferry to the City Centre, then catch the bus to K Road, it’s still the same three zones, all for a three zone fare. ahhh now I see, if that will be the case & you look at it that way. Though it is a weird 1 zone price if you do the ferry only. So – pack your togs to save 2 zones worth of fare. The ferry trip is really one zone (not that I even endorse zones). Here’s why. If you make a shortish trip to the edge of the City zone from the west, from the south or from the east it’s always one zone from points such as New Lynn, Onehunga and GI. If you carry on past the boundary into the City zone, then it’s a two zone trip. The same logic applies from the north. You can travel from somewhere in Devonport to the ferry terminal at the northern edge of the City zone and it’s one zone, or you can carry on into the City zone and then it will be a two zone trip. There’s no logical way to turn this into three zones! I think Sailor Boy is right. The thing to remember about public transport pricing is that fares are not set to make equivalent journeys have similar prices. Fares are set like most other monopoly goods and services in life where you look at the willingness to pay. That means if you can increase a fare without it resulting in lots of people being priced off then you increase fares. Ferry passengers don’t have many alternatives and usually they have good incomes so you don’t set out to make thing cheap for them. I thought that fares are set to recover 50% of the operating costs? Or is that 50% across the whole network, with cross-subsidisation? Yes across the whole network. For example busy bus routes subsidise empty ones too. The NZ tradition is under fund ferries, as the can get away with it, and heavily subsidise rail as it is really expensive to build and run so incredibly embarrassing to them if it isn’t used by enough people. To be fair our rail is probably subsidised less than most countries. Isn’t the fare box recovery on rail pretty good these days? Rail is subsidized less than buses per passenger kilometre at the moment so your theory is a bit broken…. So long as you can frame the measure to be used you can win any argument. How does rail look per trip? Is per trip relevant? We know that trips on the rail network are, on average, far longer and therefore, probably justify a far higher subsidy. The two relevant metrics are subsidy per kilometer and subsidy as a fraction of cost. They are both relevant, but obviously for different reasons. PT subsidies are effectively a transfer payment. Tax is taken from someone and spent on someone else so at a policy level we need to be interested in how much does someone get, how much does it cost others and is it progressive or regressive. To that end the amount per trip is relevant. If poorer areas are paying more than they receive and richer people are the beneficiaries then we need to know that too. Ditto for roads, of course. Fair point. I don’t think that any of those figures are anywhere near granular enough to be useful for that analysis though. It would be interesting to see how we would invest if we wanted to look a bit more at equity though. Because of the fare increases it is now cheaper to drive to work for some than take public transport. In fact it’s cheaper for the whole family. So you guys can add 4 to the number of cars going into the city every morning starting Sunday! I certainly hope there won’t be too much penny pinching going on with services, bus stop shelters and such. I think this is certainly a thing the government needs to change so AT can give a full quality service that they are trying to provide. Totally agree with Matt’s “My thoughts” section at the end. “We built it based on the expected economic impact it would have.” this certainly needs to be incorporated better into the evaluation of PT systems. I have nothing yet to alter my impression AT sees itself as a transport company that offers a tacked on passenger carriage service rather than a passenger carriage business that happens to use buses and trains. Like all AT projects, especially in the PT area. Massive go-slow Sunday driving. Most stops still have no shelters, and I havent seen any neighbourhood stops, perhaps those slightly bigger ones at mangere and otahuhu township are based around those designs – not 100% sure. Still a lot of old adshell shelters too. Their excuse for the CBD stops is mostly “CRL Works” and for those outside of the CBD who knows, opposition from locals or funding issues? Hard to say – but definitely not much progress. My local stop which is a train & bus transfer point (as well as a rail replacement stop) still has no shelters, even though 2 year ago AT sent me an email saying the stop was a priority for them and they should have it done within 6 months. But… guess what? Still nothing, just some wonky bus stop signs (that were already there) that look like they are going to fall over at any moment and that is it. 94% is great, no need to make any further improvements then. We have the best services ever. Sounds like some rigged election to me. I really question the point of those customer satisfaction numbers. They really are a subjective, arbitrary measure. What questions are they asking, who is being asked, how are they asked, what answers are possible, what service are they in reference to, etc. 94% satisfaction with trains?!? I don’t question that that is the value their surveys came up with. I question the entire basis of the surveys. That to me suggests people are over the moon with how awesome our train service is. I find that hard to believe. Are the people surveyed using the crap old trains as comparison, so then the new trains are great, so we must have a good service. 100% of Aucklanders are AT customers. 80% of Aucklanders don’t even use PT so clearly 80% of Auckland think the PT service is utter rubbish to the extent they never use PT except when they have no other option. People choosing to use PT regularly. That is a far better measure of the effectiveness of the service being given to customers. Yeah the other day I wanted to get to Chelsea near Birkenhead. 25 min drive vs 2 hour bus and walk. My opinion of that PT option won’t appear in their satisfaction stats. Your also missing out on the likes of myself, who don’t even bother giving feedback anymore as they either ignore me or give a garbage response, I have sent several forms *requiring a response* and heard nothing. Those that I do actually hear something back on (none recently) are a copy paste response after several weeks of waiting. Nothing more frustrating than wasting my time on giving them feedback. As usual AT base everything on data instead of facts, evidence and proper research – thats why they are a dysfunctional organization with their heads in the sand using data to justify more of the status quo. Slightly off-topic, but my Supergold ATHOP card has lost its sheen since the New Year and is charging me for all trips that used to be free. Maybe this is part of a new policy that got accidentally implemented early? Gosh – will you please update us when you find out why? Who knows, this may affect all concession cards, too. The reasons why many children’s cards revert to charging adult fares doesn’t seem to apply in your case because you had already been using the card. Most strange. Thanks Heidi. I successfully used their web form to get refunded for January but the gouging is ongoing. Suspect I will have to endure helpline hell to get a human answer. I don’t feel younger but AT HOP website says my Supergold status expires in September 2019. That is a worry. My gold HOP card works again. AT’s style of customer service defeated my curiosity so the cause of the outage remains a mystery, sorry! Well well well. Where’s that attitude when it comes to PT projects? For example, consider the lower North Shore, where a lot of movements aren’t supported at all by PT. For example, just about any journey crossing the motorway. As I understand there’s a lot of growth happening / planned in centres like Takapuna and Northcote. Having at least one cross-town frequent bus connecting those centres now would be a smart move. Then at least some of those developments could adapt to a reality where at least a little bit more people are able to reach them without a car. But no. Nothing there, even in the New Network. And then we’re left wondering why Panuku is going to build 500 extra parking spaces in Takapuna. Well, look: if you want a centre to thrive, people need to be able to access it. If they reduced the cost more people would use PT and they would have more users and more money at the end of the day – to be able to add more services and get even more people onboard. The current cost of fares is a massive barrier for many, especially when trying to transition and/or share the cost from/with car ownership. So many less well-off folks in my area tell me the cost of PT is luxury, especially with barriers like having to pay $15 every time you misplace or loose your HOP card or when you just want to transition over. Yet ironically PT users are treated like scum in comparison to motorists. The fares are also massive in comparison for anyone who shares a vehicle and/or has free parking at their destination. Presently the only PT incentive is for single-occupancy paid parkers and congestion dependent on your travel path and/or when you travel. Peter N, an increased government subsidy is one way. Or AT could become really serious about wanting people to travel by PT and increase the cost of parking (just like happened in Vienna). AT seems to be the common denominator in holding down parking prices. For example, in Takapuna (if you are lucky enough) you can lease an AT car park for $7 per day. Cross the road and pay $14. Go across the road and around the corner, $14; and around the other corner $14. Let’s do the maths. 180 car parks x an extra $7 per day x 200 days = already $250k towards funding public transport. But the really big gains will come from the AT city car parks where again these are the cheapest around. There is absolutely no incentive to take the bus when Victoria St car park is only $2 per hour on the weekend. Weekday rates are also very cheap. It amazed me how expensive comparatively it was to park in Sydney where the market is largely provided by private operators. 1) Road users don’t pay congestion tolls when they should. 2) Ratepayers subsidise road users by paying about 50% of local transport infrastructure costs. (Personally I don’t even think there is justification for ratepayers to pay for footpaths and cycleways when it is necessary from a safety perspective to provide those facilities to stop people getting killed by car drivers.) Petrol fuel taxes should thus be higher. 4) Given all of the above the immediate fare increase should be funded by a regional fuel tax. Come on New Government, let’s see your New Government Policy Statement on transport. Get rid of the Old Government’s outdated obsession with 50% farebox recovery ratio. Get rid of it, boost off-peak services, and watch PT patronage rise to the extent that 50% may be achieved anyway, with lower fares. Not one mention in this post of one of the obvious reasons for a decease in revenue despite rising patronage on the rail system – fare evasion! If AT were to acknowledge the serious flaws with the current voluntary payment system for using the Auckland rail system and were to make some much needed changes, more revenue could be gathered. The blatant large scale fare evasion particularly during interpeak, evenings and on especially on weekends, needs sorting out to capture this ever increasing loss of revenue rather than charging the honest people who do pay, more. AT and their train operator Transdev could keep all the Train Managers on the trains but get them checking all passengers to make sure they have a ticket or HOP card on every train, similar to when they did ticketing in the past before the AT HOP ticketing system came in. Once the word gets out in the community that you will get checked for a ticket on every train again, people will start paying or the problem people who don’t pay will discontinue trying to ride the trains for free. The new Transport Officers can carry out their function with more thorough checking with HOP card scanners and enforcement with randomly patrolling across all modes – bus, train and ferry, with supporting the Train Managers on the trains. More staff on trains, means safer trains and also means less likelihood of problem people riding around on the trains because it is free and easy to do, reducing the amount of vandalism to trains, which in turn reduces the amount of cost of running the public transport system with vandalism repairs, graffiti removal etc. The decrease in revenue has happened since 2016 when the new network and integrated fares were introduced. If it was related to fare evasion it would have happened in 2012 when TMs and Passenger Operators stopped inspecting tickets. I’m really not sure why you think one TM on a train checking tickets would be of any use, those who haven’t got a ticket would just move around the train to ensure they don’t get checked.